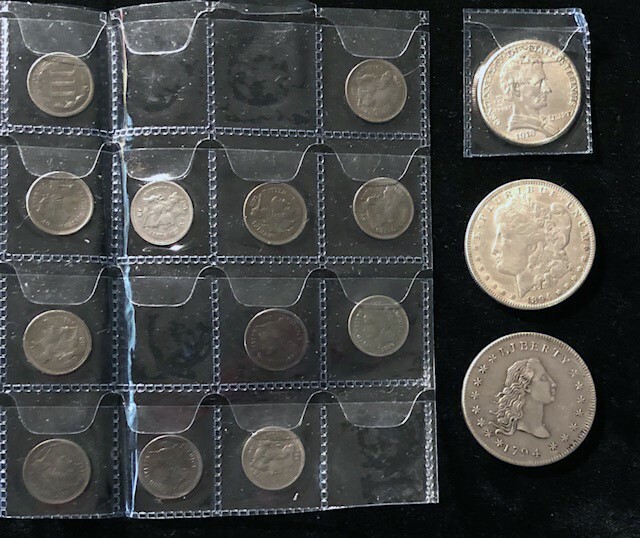 The Industry Council for Tangible Assets Anti-Counterfeiting Task Force will exhibit a five-case display of counterfeit coins, precious metals bars, and grading holders during the American Numismatic Association’s World’s Fair of Money Aug. 14-18 at the Pennsylvania Convention Center in Philadelphia. The counterfeit items are on special loan from the Cherry Hill, N.J., office of Homeland Security Investigations, U.S. Department of Homeland Security. The items were confiscated during HSI’s investigation of a New Jersey man, 34-year-old Jonathan A. Kirschner, who pleaded guilty June 25 to impersonating a federal agent while selling counterfeit coins and bars and unlawfully importing counterfeit coins and bars into the United States. 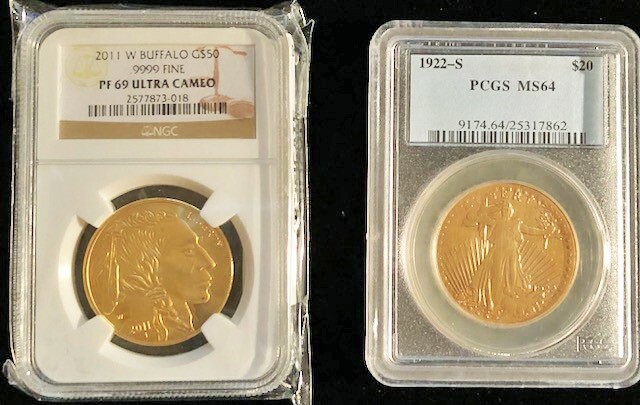 Left, fake 2011-W gold $50 Buffalo bullion coin in fake NGC holder. Right, fake !922-S Saint-Gaudens $20 double eagle in fake PCGS holder. These fakes will be among those in a special exhibit of counterfeits on special loan from the Department of Homeland Security during the WFOM in Philadelphia Aug. 14-18. The fake coins and bars in the exhibit constitute about 20 percent of the items seized during the investigation. If genuine, items in the exhibit would have a current estimated retail value of more than $10 million. Among the counterfeits to be on display in the special exhibit are fake gold bars in fake APMEX, PAMP, and Royal Canadian Mint holders. “We are highly appreciative of the Department of Homeland Security’s cooperation in loaning these items for public display,” said Beth Deisher, ICTA’s director of anti-counterfeiting. “It is important for collectors and the public to understand the wide range of coins and precious metals bars being counterfeited. Equally important, the buying public needs to be aware of the levels of deceptiveness. Educating the buying public is one of the best defenses we have to thwart the counterfeiters,” Deisher added. Sampling of fake coins in the special display include nickel 3-cent coins, 1918 Illinois Centennial commemorative half dollar, 1894 Morgan dollar, and 1794 Flowing Hair dollar. The special exhibit of counterfeits will be displayed in the non-competitive section of educational exhibits on the bourse floor of the World’s Fair of Money. “We would like to thank the ANA for its cooperation and providing the space and cases for this special exhibit,” Deisher said. “ANA’s primary role is to educate the public about coins and coin collecting. Exhibits like this are an excellent method of disseminating important information,” Deisher said. 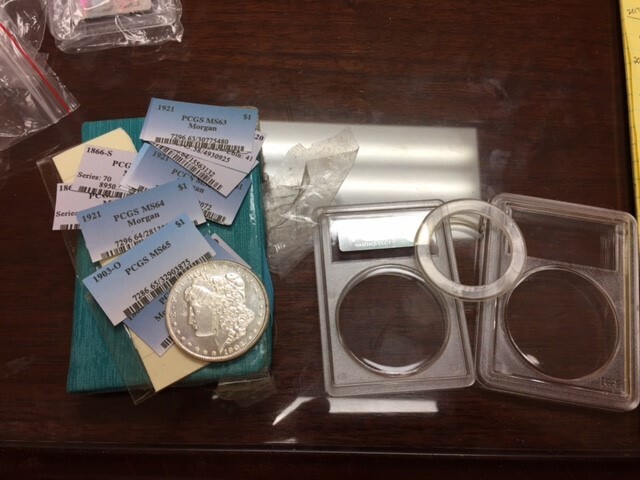 Counterfeit Morgan dollar as well as counterfeit PCGS inserts and components of fake PCGS holder are among seized items sized by Homeland Special Investigates division of Homeland Security. ACTF was first to alert law enforcement about Kirschner posing as an ATF agent and selling counterfeit coins. Two people took their newly purchased Morgan dollars to a coin dealer for evaluation, only to be told they were fake. The dealer alerted ACTF, which contacted federal law enforcement. Members of ACTF also worked closely with investigating agents, providing expert identification and evaluations of the counterfeit coins and bars Kirschner imported from China and other countries. The charge of impersonating a federal officer carries a maximum potential penalty of three years in prison and the charge of unlawful importation carries a maximum potential penalty of 15 years in prison. Kirschner’s sentencing is scheduled for Oct. 1.